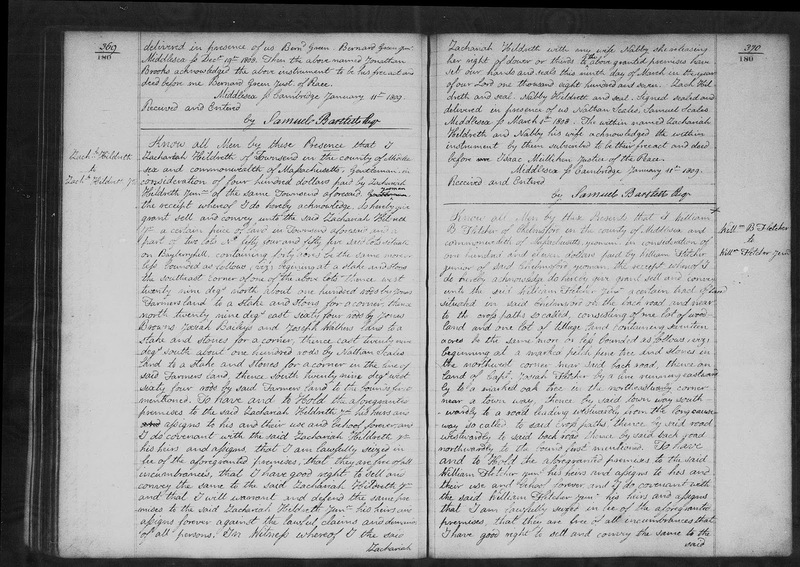 Genea-Musings: Amanuensis Monday - 1807 Deed of Zachariah Hildreth to Zachariah Hildreth Jr. in Townsend, Mass. Amanuensis Monday - 1807 Deed of Zachariah Hildreth to Zachariah Hildreth Jr. in Townsend, Mass. before me Isaac Mulliken, Justice of the Peace. Middlesex Ss Cambridge, January 17^th 1809. 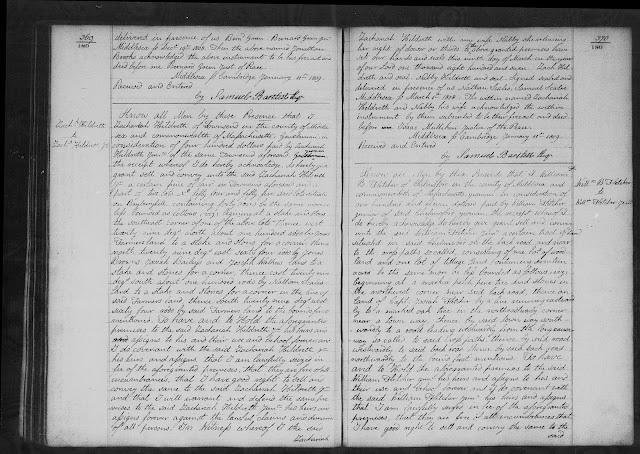 "Massachusetts, Land Records, 1620-1986," digital images, Church of Jesus Christ of Latter-Day Saints, FamilySearch (https://familysearch.org : accessed 23 September 2018), Middlesex County, "Deeds, 1808-1809, Vols. 179-181," Volume 180, page 369 (image 456 of 799), Deed of Zachariah Hildreth to Zachariah Hildreth Jr., executed 9 March 1807, recorded 11 January 1809. Zachariah Hildreth Junior (1783-1857) was the son of Zachariah Hildreth (1754-1829) and his first wife, Elizabeth Keyes (1759-1793). This is the first land transaction for Zachariah Junior in the Middlesex County Deed index for 1800 to 1835. The land sold is 40 acres on Bayberry Hill in the town of Townsend, Massachusetts. It is 100 rods (550 yards) by 64 rods (352 yards), situated west-northwest to east-southeast, and was part of Lots 54 and 55 of the original land lots of Townsend. The map above is about 17,600 feet wide, or 5,867 yards. So the land (550 yards wide) would take something like 1/11th of the width of the map above. Bayberry Brook is the stream in blue in the middle of the screen above, and Bayberry Hill Road is below the stream (note that "The Flower Hutch" blue stickpin is on that road). 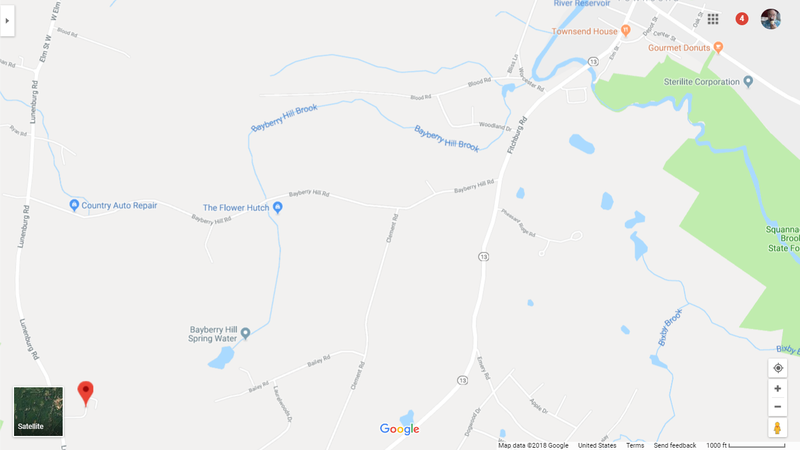 The red stickpin in the lower right-hand corner of the screen above is Bayberry Ln, which is what came up when I searched for "bayberry townsend ma." My guess is that the land is somewhere between the red stickpin on the southwest and Bayberry Brook on the northeast, perhaps near, but not on, one of the roads. Zachariah Hildreth (1754-1829) is my 4th great-grandfather, and Zachariah Hildreth Jr. (1783-1857) is my third great-grandfather, who married Hannah Sawtell (1789-1857) in 1810. I am descended through their son, Edward Hildreth (1831-1899) who married Sophia Newton (1834-1923).